SignPly features a single-sided, painted aluminum face on a premium furniture-grade, exterior plywood. 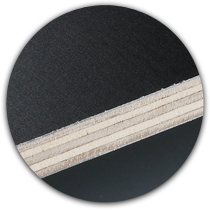 SignPly has a factory-baked polyester paint on the finished side with a mill-finished aluminum backer that provides balance and prevents warping. NOTE: Must be edge-sealed for outdoor use.